Among Aldi’s selection of live plants sold each spring, there are always a few berry bushes. Blackberry, raspberry, and blueberry bushes are common at my local Aldi stores in the Midwest. Today, I’m taking a look at the Gardenline Everbearing Raspberries, which sold for $5.99 at the time of publication. Opening the box reveals two stick-like plants packed in a plastic bag. 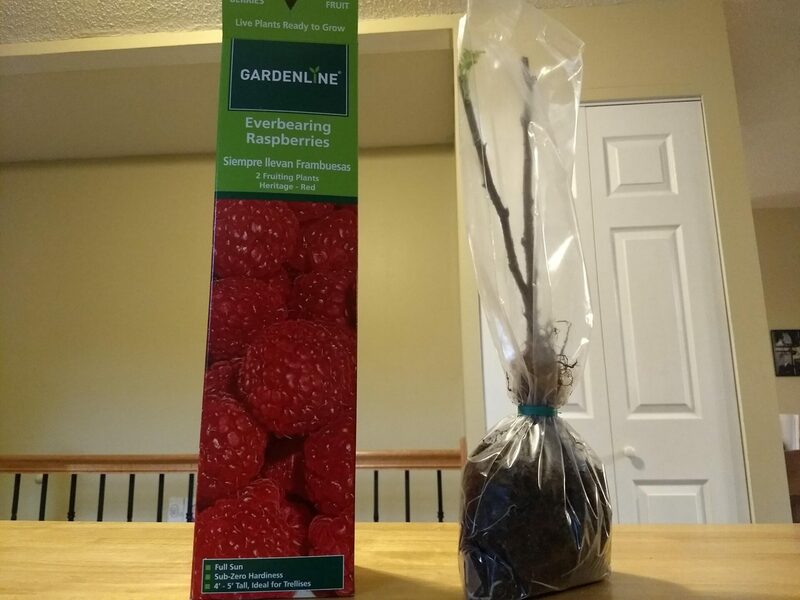 The box states it contains “two live plants ready to grow.” Aldi often sells bushes and bulbs in dormant root form, but these raspberries actually had a few tiny leaves sprouting from the stems or canes. Everbearing raspberries also may be called fall-bearing raspberries, and they produce two crops of berries annually, once in early summer and again in the fall. Better Homes and Gardens recommends that plants should be spaced about 20 inches apart, with rows five feet apart. 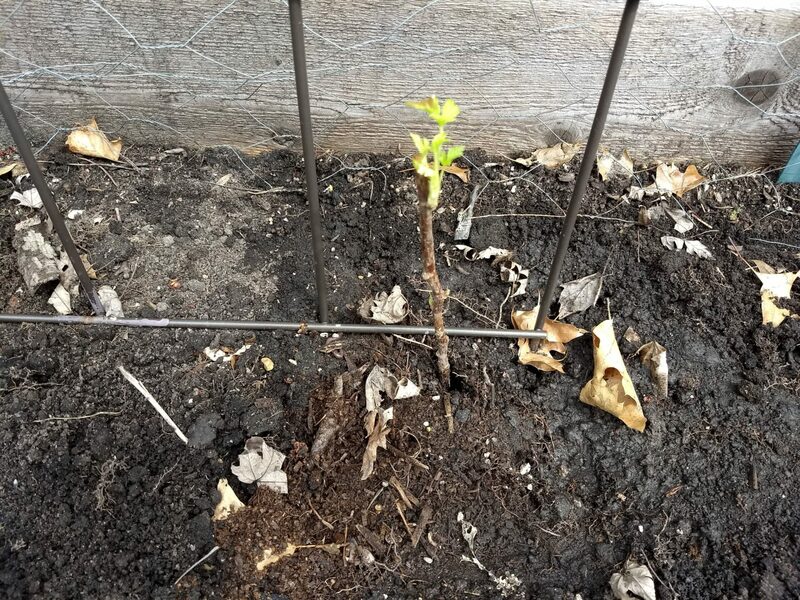 Raspberries spread prolifically, sending up new canes or sprouts, which can easily be cut down to control them, or they can be dug out and shared with friends. Raspberries need a trellis or two to provide support when the canes are weighed down with fruit. 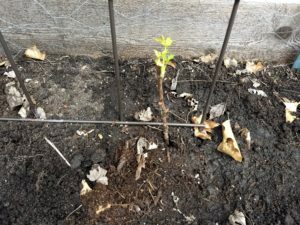 You can read more raspberry-growing tips at Fine Gardening, including how to build a trellis, how to prune, and common diseases. Remove the plant from the poly bag and soak roots in water for an hour. Select a location that receives several hours of sunlight daily. Dig a hole at least 15-18 inches square and deep. Loosen the soil thoroughly to allow the young plant to send out fibrous roots and to get off to a fast start. The hole should be large enough to spread the roots out without crowding. Cut the plant back to about 6 to 10 inches in height. Fill the bottom of the hole with enough good top soil to bring the plant to about the same depth it stood in the nursery. Sift soil between roots and fill the hole to within 2 inches of the ground surface. Tamp the soil firmly with your feet. Fill the hole with water and allow it to soak in. Completely fill the remainder of the hole with top soil. Leave a saucer-like depression to catch rainfall. Keep well watered for the first two weeks and then water thoroughly during any dry spells. When you are done, the cardboard box is recyclable, or it can be put in your compost pile. 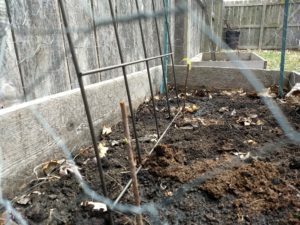 I planted my two raspberry plants in a fenced-in 4-foot by 2-foot homemade raised garden bed in my back yard with a trellis. I also have a raised garden bed from Aldi, but it’s already filled with a thornless blackberry plant and some rhubarb. These raspberries are my latest attempt to establish some perennial edible plants in my garden. The raspberry plants are tiny and twiggy, with a few small green leaves showing here and there. I will keep them well watered and try to protect them from nibbling critters, and I’m curious to see how they do this year. I’ll update this post with new developments, so check back later. Aldi’s Gardenline Everbearing Raspberries are an interesting addition to my back yard garden. They were inexpensive and came packaged in a box in an almost dormant root state, with just a few tiny leaves growing on the canes. They were easy to plant after soaking the roots in water for an hour, and I’m looking forward to seeing how they do in my garden this year. Check back for updates.